Nuclear factor-κB (NF-κB) transcription factors and the IκB kinases (IKKs) that activate them are central coordinators of innate and adaptive immune responses. More recently, it has become clear that NF-κB signaling also has a critical role in cancer development and progression. 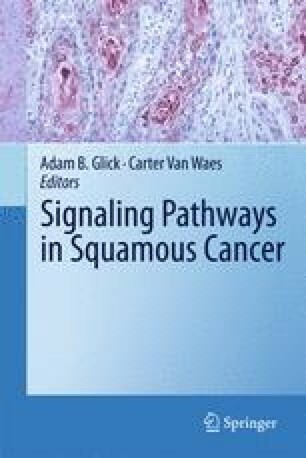 The canonical NF-κB pathway contributes to squamous cell carcinoma (SCC) development by interacting with other signaling pathways including tumor suppressive and oncogenic pathways in a tissue specific manner. In this chapter, we will summarize recent advances in the understanding of interconnections between NF-κB and IKKs, including IKKα which has NF-κB independent functions, in the context of SCC development and progression and as potential target for novel chemotherapy approaches.